Each Panel is 32" High, 31" Wide One easy to open door Heavy Duty 1/2" Tube Frame. Heavy Duty Pet Playpen is the must have for your dog, it is easy to set up and you have tons of way to set it up both indoor or outdoor. Each Panels dimension: 32" Width, 24" Height. Comes with an easy access door with double locks to make sure your pet does not get loose. Can be rearranged into many shapes. ATTENTION: Please make sure you do not leave any pet unattended while using this product. Make sure to monitor all pets while the play pen is in use. If you have any questions about this product by BestPet, contact us by completing and submitting the form below. If you are looking for a specif part number, please include it with your message. 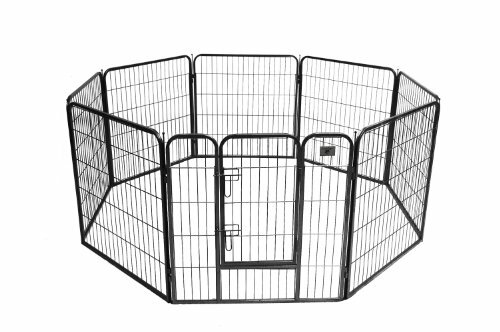 Pet Trex Exercise Playpen for Dogs with High Panel and Gate, 24 x 30"